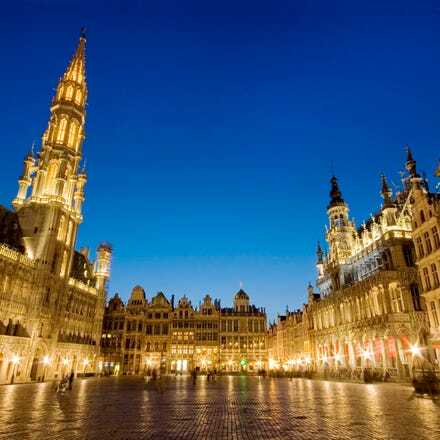 Take advantage of cheap flight offers to Brussels from Dublin with Aer Lingus and enjoy a break in Belgium's first city. Historic buildings abound, with gems such as the UNESCO World Heritage Sites at Grand Place and the Royal Palace just waiting to be explored. There is a vibrant nightlife and endless opportunities to try the many local beers, too. Choose from the many eateries and cafés to sample the local cuisine and luxury chocolate delights. Brussels, a city that continues to surprise and move you. This city-region-capital of 500 million Europeans is waiting to share its treasures with you. It's a fair bet that its stormy history is the reason for its open-mindedness, warmth and friendliness. You'll feel right at home in Brussels! As well as its historic monuments, Brussels has so much to share with you: its comic strip speech bubbles, its Art Nouveau façades, the talent of its stylists and designers, its delicacies and its surrealism, which can be found on every street corner. Brussels airport is located in the area of Zaventem, around eight miles from the city centre. The quickest way to get to Brussels is on the STIB Airport Line bus, which takes around half an hour. Alternatively, you could take buses 12 or 21. Buses run from 5am until 11pm, and come along every 30 minutes or so, setting off from platform C. The bus station itself is located one floor below the airport arrivals hall. You can also take the train from the airport train station, which can be found on level -1 of the terminal building. Trains run from 5:30am right up until midnight, and you can buy your tickets at the station. The name of Brussels’ public transport company is STIB. Not only can you take the efficient Metro, or hop on one of many buses, but you can take in all the wonderful sights by renting a bike in Brussels. Visit the STIB website for updated information on public transport in the city.